Making gluten free rice crispy treats proved harder than anticipated last week, but still…I persisted. When you have a craving, there is no denying it! I mean, who doesn’t love rice crispy treats? Is there a person like that out there. No, really? Is there? This post contains affiliate links. I love to share my favorite finds, and all opinions are always mine. Did you know Rice Krispies contain gluten? Unless you are gluten free, probably not. They contain malt flavoring. After checking two grocery stores and a quick Google search, I found that Kellogs stopped making their Gluten Free Rice Krispies (so, I totally refuse to call this post “Gluten Free Rice Krispie Treats with an Autumn Surpise”). I was heart broken. After searching the shelves high and low, I found Erewhon Crispy Brown Rice Cereal. It is organic, non GMO and certified gluten free. My rice crispy treat game was back on! So, now for the autumn surprise. Candy Corns! I am sure I originally got the idea a few years ago from a box of that other cereal that shall not be named. After realizing Halloween candy is already being stocked in the stores, I picked up a bag for my treats. 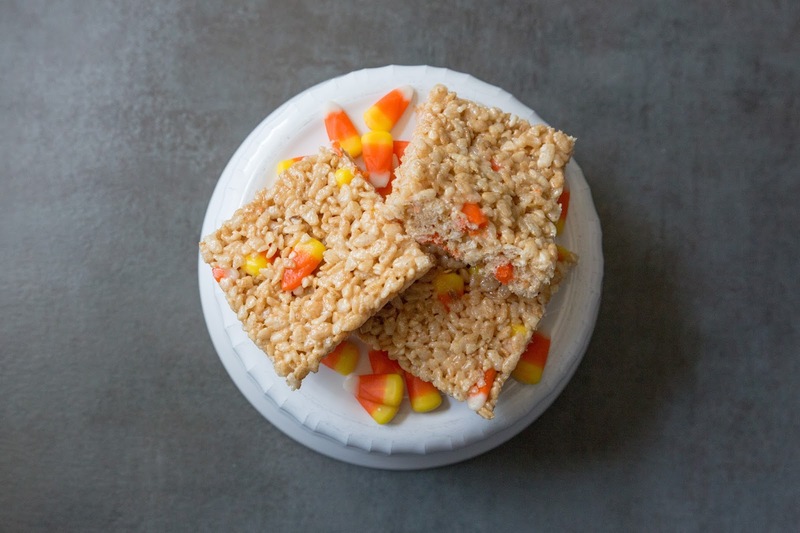 This recipe was adapted from the All Recipes traditional crispy marshmallow treats directions, with modifications for gluten free crisps and candy corns. Melt butter in large saucepan over low heat. Add marshmallows, stirring until melted. Stir in vanilla extract. Gradually add in cereal and candy corns, alternating and stirring. Pour mixture into buttered 13x9 inch pan. Press flat with waxed parchment paper. Cool, cut into squares and enjoy! Are you prepared for fall? Bring on pumpkin flavored everything; but first, start with these gluten free rice crispy treats with candy corns.